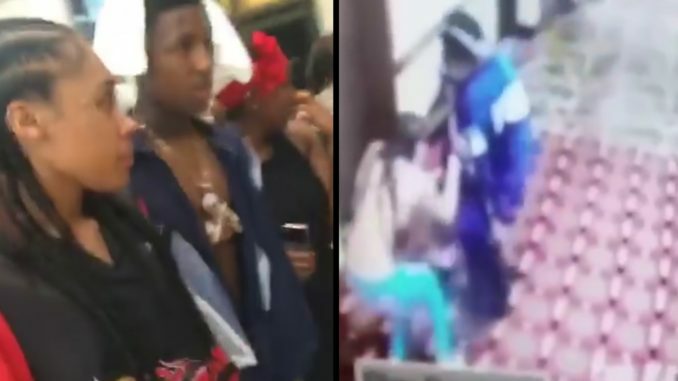 A video allegedly showing NBA YoungBoy abusing his girlfriend Jania is making it’s rounds online. The video shows a young man throwing a woman around in what appears to be a hotel hallway. The young man and woman are wearing similar outfits worn by Jania and NBA YoungBoy and the young woman has the same braided hairstyle as Jania. Jania and NBA Young Boy were in Tallahassee, FL when the videos were taken of them with fans. The 18 year old rapper, whose real name is Kentrell Gaulden, was booked to appear at Tallahassee’s Moon Nightclub, but was arrested. Leon County sheriffs ran NBA YoungBoy’s records and saw he’s a wanted fugitive in Georgia for alleged charges of kidnapping, assault and weapons violations, according to TMZ. This wouldn’t be the first time NBA Youngboy mistreated Jania.